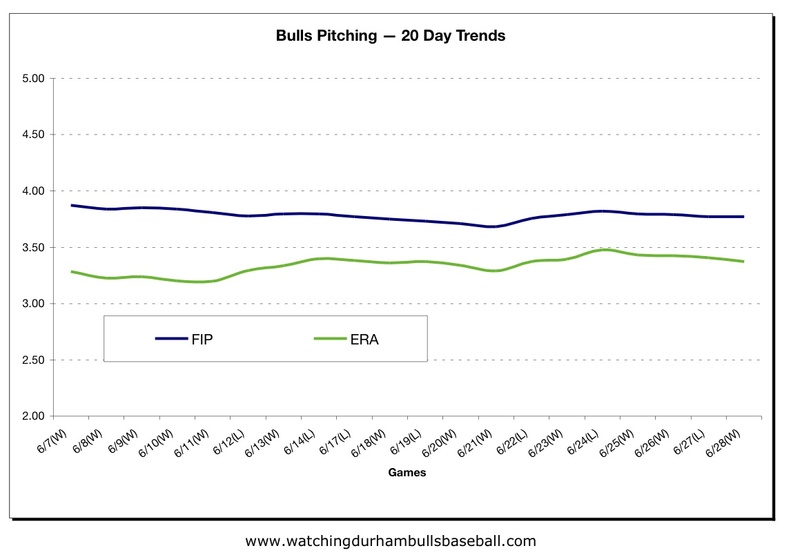 We haven’t put up a look at Bulls pitching for quite some time. Since we just went past the midpoint of the season, probably a good time to take a look. 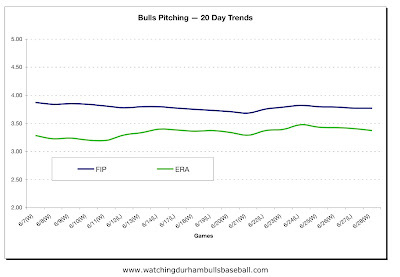 First, this chart that shows the continuing cumulative trends of Fielding Independent Percentage (FIP) and Earned Run Average over the last 20 games. Over this same period the Bulls have won 11 and lost 9. Thus, no real surprise that the trends are pretty flat. At this level of play, that’s mostly a good thing. 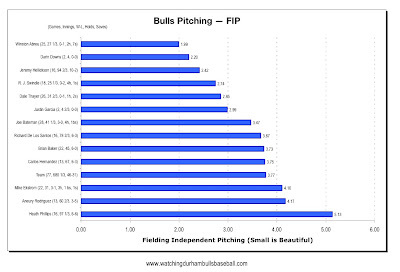 Taking a look at the individual pitchers, I’ve rank-ordered them by their FIP numbers. Their ERA numbers are not much different, with the exception of the newcomers. Darin Downs and Justin Garcia’s numbers are not to be trusted this early in their Triple-A experience. Carlos Hernandez is on the disabled list, but I’m hoping that he will be back soon. 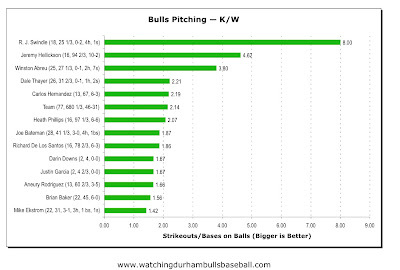 No surprise that Hellickson is up near the top, or Winston Abreu for that matter. Joe Bateman and R. J. Swindle are looking pretty good, too. 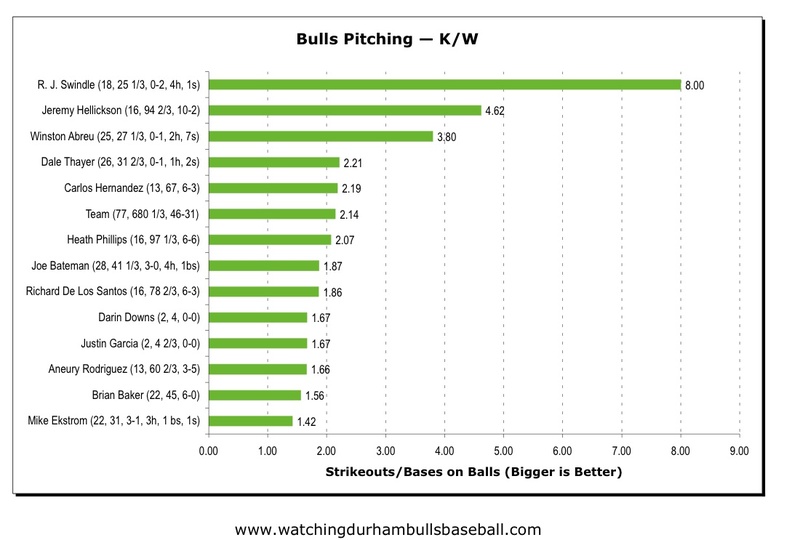 The strikeouts/walks chart is mostly to show off the ridiculous performance of R. J. Swindle. His bar represents 3 walks and 24 strikeouts. Overall, Bulls pitching looks pretty good. Saw Virgil Vasquez in uniform a day ago. When activated, someone here is going to get pushed out (probably Garcia or Downs). Haven’t heard anything about Jason Cromer (also on the DL). His year is beginning to look like a washout.